Colleagues described Richard Heard as "a wonderful person"
Two people have been killed and 46,000 homes are without power as 80mph winds caused widespread problems in the Midlands region. Richard Heard, 49, managing director of Birmingham International Airport, died when a tree branch went through his windscreen in Shropshire. A 60-year-old man died when he was hit by a tree while he was working on a site in Byley in Cheshire. 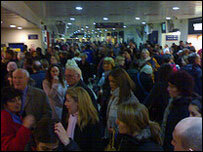 Network Rail said commuters will still face some delays on Friday. Virgin Trains suspended West Coast Mainline services through Stoke-on-Trent and Staffordshire due to overhead wire damage and cancelled one train an hour between Birmingham and London Euston. Crewe station, in Cheshire, may not reopen until Friday afternoon because part of its glass roof was damaged and problems with overhead cables will cause disruption on services in Walsall and Perry Barr on Friday. There are still speed restrictions on Central Trains with expected delays and alterations at short notice. Chiltern Trains has reduced its services between Birmingham and London Marylebone to one train per hour and services between Stratford-upon-Avon and London have been suspended. Birmingham New Street was temporarily closed during the rush-hour for safety reasons as hundreds passengers filled platforms waiting for cancelled services. Staff used megaphones to give out passenger information as police kept passengers away from the ticket barriers. In Hereford, Eign Gate and West Street closed for a while after debris fell from a shop roof. Electricity distributor Central Networks said engineers are working "very, very hard" to restore supplies after strong winds brought down power lines but some residents would be without power overnight on Thursday. A total of 167,000 have been without power across the Midlands. Customers in Shropshire, West Midlands, Staffordshire and Coventry and Warwickshire are also affected. Many customers, especially in rural areas are now without power. In Staffordshire, ambulance crews were called to Blake Valley Technology College in Hednesford when tiles blew off a roof and hit three young teenagers. One was knocked unconscious and was taken to hospital suffering from breathing difficulties, while another suffered a suspected broken arm and wrist. The third suffered facial injuries. Elsewhere in Staffordshire a woman has been treated by paramedics after a tree fell on her near the entrance to Stafford Castle. In north Staffordshire the A53 Leek to Buxton road has been closed because a number of lorries have blown over. Two men were treated for hypothermia and exposure after being rescued from nearby moorland in the early hours of Thursday. In Shropshire, Mr Heard was killed on the B4373 Bridgnorth to Broseley road at about 0545 GMT as he drove to work. The head of corporate affairs at the airport, John Morris, said: "Richard was a wonderful person, who brought us strong leadership with a human touch. "Our immediate thoughts are with Richard's family, at this sad and difficult time." 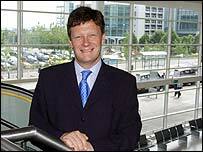 Birmingham Chamber of Commerce said Mr Heard would be greatly missed. "He played a full and enthusiastic part in the fortunes not only of the airport but Birmingham business as a whole," a statement said. 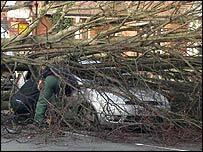 Five schools in Shropshire have also been closed because of the storms while some roads have been affected by flooding. A flood warning has been issued for the River Severn in the Shrawardine area. A Worcestershire tourist attraction is also on high alert in case its windmill "takes off". Helen Coleman, of the Avoncroft Museum of Historic Buildings, said it has only been saved because two of the sails were being repaired. Gusting winds forced the abandonment of Wolverhampton's race meeting after the jockeys got to the start for the first race. The meeting at Ludlow was also cancelled. 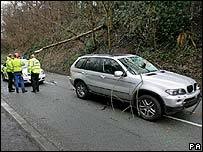 Drivers are being warned to take care, especially on exposed roads.